Information and communication technologies (ICTs) and digital platforms are increasingly seen as helpful in handling the consequences of the global surge in forced international migration. But while extant evidence on the impact of digital tools cluster around short-term emergency management, less is known about their role in dealing with long-term issues of refugee integration. This PhD project will explore the role of digital technologies in refugee integration, both from the perspective of host governments and social enterprises complementing the efforts of the state. The project aims to draw on in-depth ethnographic approaches to generate valuable knowledge on how ICTs can foster long-term social inclusion, and on the complex relationships connecting digital technologies, social enterprises and wider institutional arrangements. 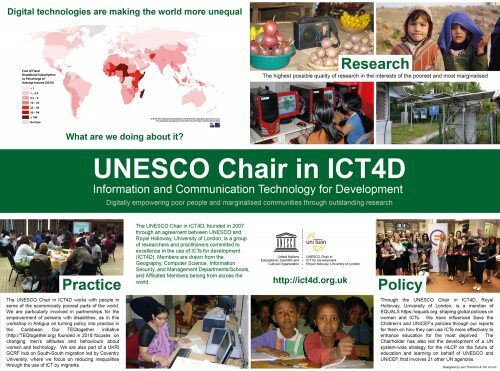 A literature review of academic research articles on volunteered geographic information (VGI) has revealed a recent, and very interesting, turn in how VGI is being viewed by academics, with implications for practitioners in ICT4D. In many ways, as I explain below, this turn is actually a return to old questions about authority, indigeneity, and ‘development’. Two recent articles indicate this turn, which deepens a critique of VGI as something separate from the act of its creation (Sieber and Haklay, 2015). Goodchild (2007 and 2016) has been at the forefront of defining and legitimising uses of VGI in academia, but in his theorisations it is often couched more in terms of geographic information science, less so in terms of democratisation and participation. Idris et al (in press) have written, for example, a very illuminating article on ‘engaging’ with indigenous people as ‘sensors’ for ecotourism. The terminology here is telling, and it comes from Goodchild (2007). The idea that a citizen (or indigenous person) can transform themselves into a sensor for contributing potentially useful spatial data on the geoweb (i.e. the ‘mappy’ fraction of the web) has a couple of facets that are worth examining, aside from the very passive connotation of the word. To what extent do the sensors themselves benefit from their contributions? What are the repercussions for protection of sensitive indigenous and local knowledge systems (such as the location of endangered or keystone wildlife species)? These are issues that go back to the early days of GIS when Rundstrom (1995) was beginning to ask questions about epistemological diversity in relation to indigenous peoples and mapping/GIS. I have written about these issues myself, elsewhere, in relation to northern Canada where social media maps hold the potential to reveal indigenous knowledge and sensitive information to outsiders. The result has often been a patch-work of local maps and map-networks that serve the needs of inhabitants of specific areas, securitised to some extent against outside viewing and user generated content. This securitisation has to be balanced against the potential uses of such data for development involving outside influence on the data. The Canadian context is vast, differentiated, and vastly different from many other (indigenous) nations, where sensitivities and emphases lie in directions specific to historical development, trajectories and narratives, especially in relation to the state. With VGI, crowdsourcing, and neo-geographies of the web continuing to evolve, the old questions keep recurring, and the idea of how much ‘authority’ and accuracy geographic information needs to have to be considered legitimate is continually being brought up. Terminologies are evolving now as we speak more now in terms of big data and the internet of things, but those old questions still apply. Goodchild, Michael. 2016. New questions and a changing focus in advanced VGI research. Transactions in GIS. Early view online. Goodchild, Michael. 2007. Citizens as sensors: the world of volunteered geography. GeoJournal. 69: 211-221. Sieber, Renee and Haklay, Muki. 2015. The epistemology(s) of volunteered geographic information: a critique. GEO: Geography and Environment. 2(2): 122-136.